SpaceTime is a unique web browser which allows you to browse and surf websites in 3D. It is something similar to the Flip 3D feature in Vista, but this thing is within the browser itself. With SpaceTime you can do a 3D eBay Search, 3D Image Search, 3D Web Search, and even enjoy 3D Tabbed Browsing. 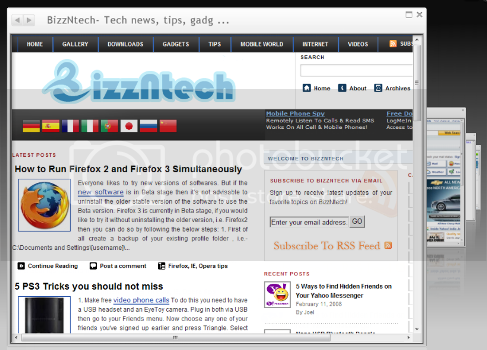 As soon as I downloaded this browser I tried out the tabbed 3D browsing, it was really awesome. You need to just enter the website URL in the address bar; it will open the web page. If you want to open a new webpage then you can simply enter it in the address bar. Once you open a new webpage, the previous page will be stacked in a rack at the bottom. You can click on the pages in the rack to open them. You can also use your mouse scroller to shuffle between pages in the rack. The next thing I tried was- 3D image search and Ebay search. They are pretty much similar. The search results are arranged in an elegant 3D arrangement. 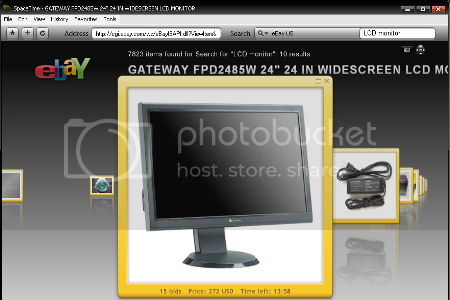 Ebay search is really awesome, you’ll be able to see the time left, bids and the price of the product. You can display hundreds of items at once to find exactly what you are looking for. 3D Web Search is something really unique. You can enter the keyword in the search bar after selecting the search engine, for example Google. Suppose you Google for ‘cricket’, the results shown on the first page will be opened in separate tabs. You can easily browse the search results without clicking the results. Well, this is something different and useful but at the same time may result in waste of time. Apart from the above features there are several other features like RSS browsing, Amazon search, Flickr search, Youtube search, etc. Social networking and email feature will be included very soon. You can download the browser from here.